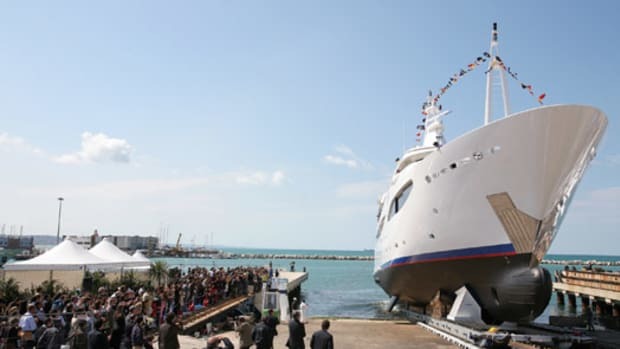 Given how the megayacht business is still strong despite weakness in some of the world&apos;s economies, it&apos;s no wonder that there&apos;s an increasing number of shipyards vying for contracts. Some of the players are long-established, while others are taking their first steps into yacht construction. That&apos;s one of the reasons why every August we publish the Megayacht Builder Directory, a compendium of shipyard names, addresses, phone numbers, and Web sites, along with brief details on their upcoming projects. This time around, however, we decided to do something different. We&apos;re presenting a sampling of yards here, but with far more in-depth info. See the A-Z list for the full directory of about 100 shipyards. Seeing a megayacht slide into the water is a pretty exciting event, but at CRN, it&apos;s particularly so, mostly because the invited attendees are, as the photo here shows, right up close to the action. (Having the stirring chords of an operatic aria fill the air as the yacht slides down the ways doesn&apos;t hurt, either.) 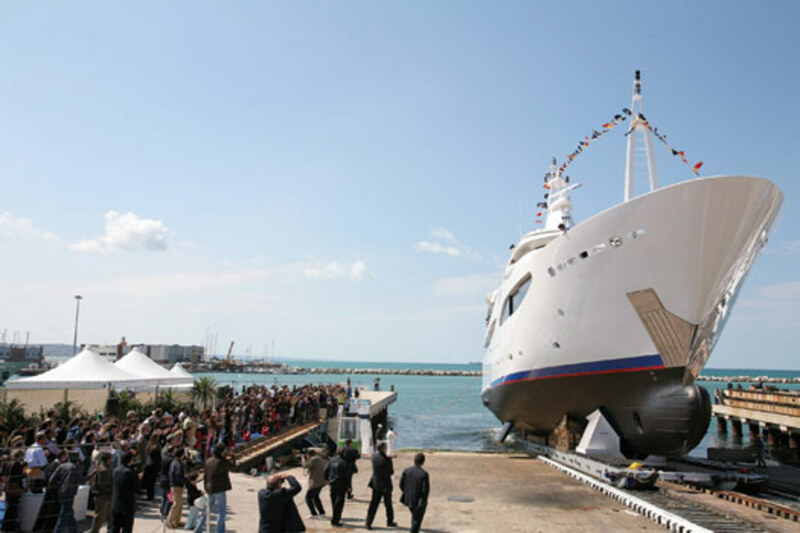 This was the scene in April when Romance, a 57-meter (187-foot), tasted salt water for the first time at the Ancona, Italy-based yard. The yacht, which should be in her owners&apos; hands by now, accommodates 12 guests and ten crew. Besides being project number 122 for CRN, Romance stands out for a few reasons: a fully operational wood stove in the large panoramic lounge on the upper deck; a Turkish bath made with scented fir for aromatherapy; a massage room with a beauty salon; and a 20-foot-long pool on the upper deck with adjustable currents for resistance swimming. A fine Romance: this 187-foot beauty launched last spring to great fanfare. In the meantime, work continues on project number 125, a custom 58-meter (190-footer) featuring a steel hull and aluminum superstructure. In fact, the hull was transferred to CRN&apos;s outfitting shed just a few days prior to Romance&apos;s launch. A portion of the superstructure was expected to be attached around presstime. When she&apos;s completed in 2010, CRN says she&apos;ll be highlighted by "a number of particularly innovative solutions for the garage and the movement of the tender inside the garage." CRN also expects to launch a 60-meter (197-foot) steel yacht this summer and unveil the third 43-meter (141-foot) composite yacht in September. 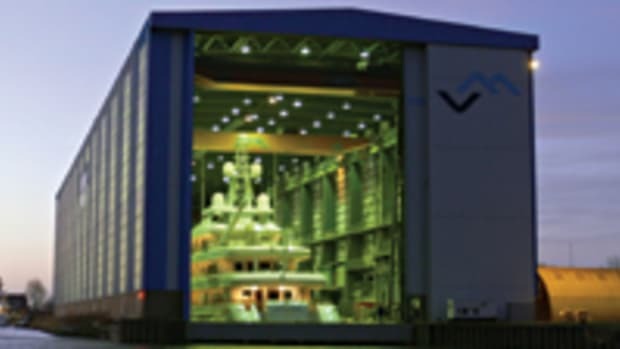 Its production schedule for steel megayachts is filled through 2013, while composite production is booked through 2011. For more information on CRN, including contact information, click here. Considering Royal De Vries&apos; build slots are booked through 2012 and Royal Van Lent&apos;s are booked through 2013, recent deliveries such as Predator and Archimedes will be in good company in the coming years. At presstime Royal De Vries was finishing its first SL39 semicustom yacht, Ocean Mercury. The "39" in her series name refers to her LOA: 39 meters, or 128 feet. The SL39 has a set technical platform but offers owners the ability to customize the exterior profile and select from a handful of interior arrangements. The latter includes things like two to four guest staterooms on the lower deck and placing the captain&apos;s cabin aft of the wheelhouse or on the lower deck with the rest of the crew. When Predator launched last spring, her hull bore a protective white coating; it&apos;s actually dark blue. Custom projects are underway as well. 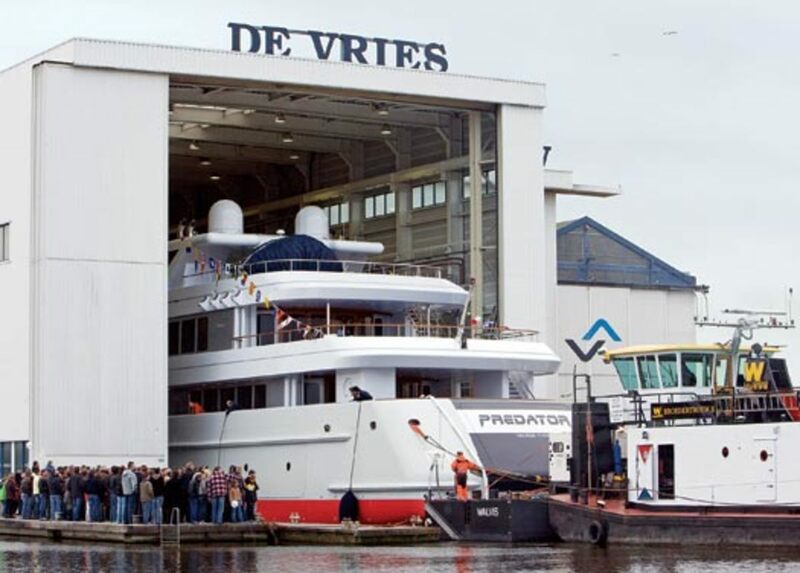 A 288-footer (no name given) is being built at its facility in Makkum, Holland, while a nearly 176-footer with a Terence Disdale Design interior is at its Aalsmeer yard. Royal Van Lent started the spring by being named Best Educational Company 2007, an award created by the Dutch Ministry of Education, Cultural Affairs, and Science more than a decade ago. As for yachts under construction, Royal Van Lent is working on the third of its semicustom F45 Vantage series. Like Royal De Vries&apos; SL39 series, the F45 gets her name from her LOA: about 45 meters, or 147 feet. The series additionally offers owners the choice of a handful of decor themes (Miami, Monaco, Milano, and Nautical). Royal Van Lent is also in various stages of construction on two fully custom yachts, referred to only by their build numbers, 800 and 801. Project 800 is a 214-footer with an interior by Donald Starkey Design, while project 801 is a 223-footer with decor by J.G. Verges Design. Both feature naval architecture by De Voogt Naval Architects. For more information on Feadship, including contact information, click here.